Each month I join Kurt Achin, host of Koreascape on Seoul’s English-language radio station TBS eFM, for an exploration of one of Seoul’s urban spaces. 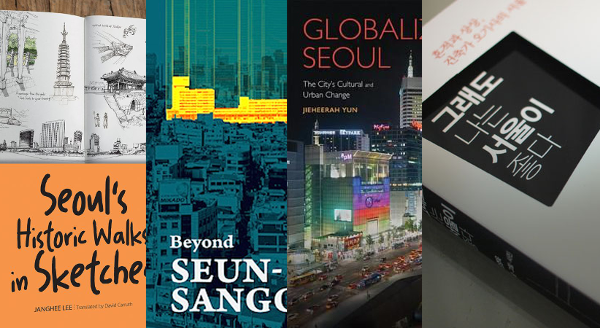 This month, as summer begins, we discuss four recommended books about Seoul, three in English and one in Korean: Janghee Lee’s Seoul’s Historic Walks in Sketches, Jieheerah Yun’s Globalizing Seoul: The City’s Cultural and Urban Change, SPACE Books’ Beyond Seun-sangga: 16 Ideas to Go Beyond Big Plans, and 오영욱’s 그래도 나는 서울이 좋다 (I Like Seoul Anyway). Each of them offers new ways to perceive and consider the city — political, economic, architectural, artistic — and paves the way for other writers to approach Seoul from their own points of view in the future. This was written by Colin Marshall. Posted on Wednesday, June 13, 2018, at 5:17 pm. Filed under books, Koreascape, radio, Seoul. Bookmark the permalink. Follow comments here with the RSS feed. Comments are closed, but you can leave a trackback.